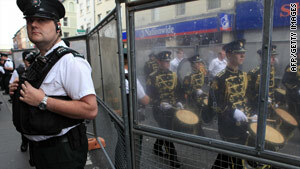 A police officer stands by barriers during the Apprentice Boys march in Londonderry, Northern Ireland, on Saturday. (CNN) -- Police in Northern Ireland said Saturday "it was an absolute miracle" that three children were not more seriously injured in a bomb explosion in County Armagh. A "no-warning" bomb went off in a bin in the center of Lurgan. The blast blew a hole in a metal fence and the children -- two of them 12 years old and one 2 years old -- sustained cuts from flying debris. The children required hospital treatment, local police said. The device exploded several hundreds meters away from where police officers were about to cordon off a school. There were earlier warnings that a device may be left in one or more schools in Northern Ireland. Chief inspector Sam Cordner of Lurgan police was relieved that the children's injuries were not worse, but he condemned the bomb as an attempt to kill and injure police arriving at the school. Meanwhile, amid tight security in mainly Catholic Northern Ireland, a Protestant group marched through the streets of Londonderry. The march began at 12:30 p.m. (7:30 a.m. ET) and ended peacefully several hours later. Saturday's march by the Apprentice Boys is the largest of several they hold during the year, mainly in summer. The march commemorates the Siege of Derry in 1689, when thousands of Protestants died. Trouble flared in Ardoyne and other areas of Belfast last month after a decision to allow another Protestant parade to pass through a mainly Catholic neighborhood on July 12, a day when Protestants march to celebrate the victory of England's King William III over his ousted Catholic predecessor, James II, in 1689. Dozens of officers were hurt in days of violence surrounding the annual event, known as The Twelfth. Journalist Peter Taggart contributed to this article.